Last night's truly awesome Futurama episode offered a ringing endorsement of evolution, but not without a twist or two along the way as its fiercest defender became the accidental creator of an entire robotic world. This week's episode, "A Clockwork Origin", felt shockingly old school, with the entire crew (minus Zoidberg) given equal time to explore a strange alien planet. This felt more like a fourth season episode than a sixth season one, and either way it was excellent, quite possibly the best episode yet of the Futurama's new run. The pacing was snappier, the jokes were funnier, and the science fiction ideas felt better integrated with the social commentary and the overall story. Even the voice performances seemed to have a little more verve and energy to them than usual. Perhaps most encouragingly, this didn't feel like an episode that was desperately shooting for classic status, like the (thankfully successful) "Late Philip J. Fry" from a couple weeks back. This was just strong, confident Futurama. Next week's brain-switching episode looks like another potential winner too. I know there's been some discussion around these parts about whether a 31st century show like Futurama should deal with contemporary issues that realistically wouldn't still exist a thousand years later. But as a general rule, I think Futurama has done very well offering a scifi spin on today's hot-button cultural and environmental topics. And anyway, the argument about evolution isn't just a modern issue. It goes right back to the famous debates between Thomas Huxley and Samuel Wilberforce 150 years ago, and it reached another flashpoint with the Scopes Monkey Trial in 1925. So I was very happy to see Futurama tackle evolution and to provide such an unequivocal, definitive vote in its favor. (Hardly surprising, considering the science backgrounds of most of the show's writers.) The drawn-out battle between Professor Farnsworth and his super-intelligent orangutan nemesis, Professor Banjo, about whether we had found the missing link was a brilliant deconstruction of the disingenuous nature of most anti-evolution arguments, as was Banjo's muttered disclaimer about evolution being just a theory ("like gravity or the shape of the Earth!"). That said, the Professor and his tenacious defense of evolution was also called into more question. He openly insulted all who disagreed with him, dismissed them as backwater idiots, and made no effort to hide his general revulsion with their beliefs. Was his attitude justified? Sort of, yeah. (As the proprietor of Chicken of the Dirt Turnips acknowledged, the Professor was lobbing some insultingly accurate stereotypes.) But it's also no wonder why - even the high society crowd at the museum was willing to go along with Professor Banjo's pleasant, "Creature-ist" inanities about Homo Farnsworth frolicking with a dinosaur 7,000 years ago. Then, because robots make everything better (and, as Bender pointed out, do everything faster), we had to have some super accelerated robotic evolution. This is maybe the biggest, craziest idea yet in a season stuffed with big, crazy ideas. It didn't make perfect sense (it's probably best to not think too much about the logic of the condensed time scale, and that solar flare was so unlikely the characters actually had to comment on it), but the world it created was well worth rationalizing a few logical inconsistencies. Honestly, as the episode drew to a close, I started hoping against hope that this was a secret two-parter, because this was a world that richly deserved further exploration. Robot dinosaurs, robot cavemen, robot 19th century (crossed with robot 1950s, judging by the costumes) - each of those could easily have been given its own episode. (Hell, each of those could have been given their own series.) But even if the episode rushed through the phases of the robot planet's nightly evolutions, the wicked irony of the situation was clear. Professor Farnsworth, the unapologetically dogmatic defender of human evolution, was now forced to be the equally dogmatic creature-ist who shattered the robots' understanding of themselves. How could he not? After all, he was the creature from the sky who created them all, so he was just telling them the truth, no matter what. Of course, the Professor's single-minded devotion to the truth nearly got him executed by a society of evolution-supporting robots. There's very definitely a lesson to be learned there. And, like every great Futurama episode, "A Clockwork Origin" was just hilarious. The b-story with Zoidberg and Cubert was short but sweet in a pathetic, Zoidberg-y sort of way. The stupid simplicity of the superheroes Father Man and Son Boy was oddly endearing, and his invitation for Cubert to join him in the dumpster was maybe the most unlikely sentimental moment in the series's long history. The rest of the crew each got at least one classic line, whether it was Hermes's hatred of pineapple pizza, Amy's advice that she and Leela should become the robot cavemen's wives so they'd get half of the rocks, Leela's battle with the pigeon on her balcony, or Bender taking up knitting as proof of evolution. 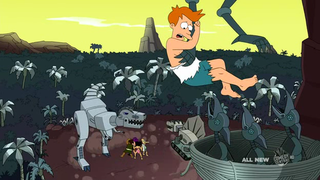 Although my favorite line of the episode was Fry's throwaway scream as the robot dinosaur threatened to eat him: "Call the police!" "A Clockwork Origin" had it all - the Professor was crotchety and insane in his devotion to science, robots literally took over a world, an orangutan in a snappy vest disproved evolution, Zoidberg attempted to be a father, limbs got cut off, and it all ended with a trial. If that isn't classic Futurama, I don't know what is.